Поступил в реставрацию моноблок Linear, в котором уже в Англии удалены внутренние платы и элементы регулировки тембров. Послушали моноблоки Linear Conchord с акустикой Lowther. Хорошо играют, но шум первой лампы EF86 немного мешает. Поэтому надо ее тщательно выбирать. 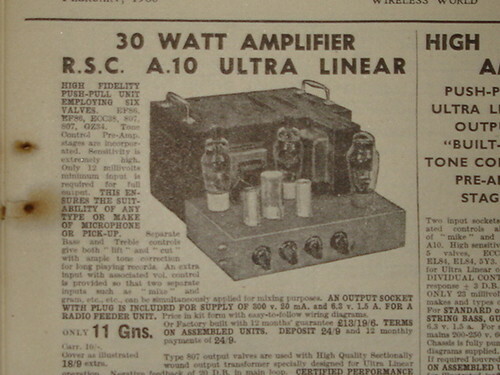 Oh don’t reverse engineer the amp!! I thought it might have been the ac30 you were modelling the changes after Im tempted to change valves around a bit to try and find the one which hisses the least. Ive heard the ef806s are good (just a shame i cant afford the telefunken ones at 240 odd pounds for two!!) but ive seen the jj and svetlana winged c ones about for 30 pounds for two and I’d be tempted to try them first but if not sadly the efs may become eccs. Before then though, after I posted the first message, I found that I can turn down the gain stage to see if any hiss goes (also no matter what the level is, whether it be 0 or 10 the hiss is at the same constant level so its definately the ef86s). Im very happy theres next to no hum though Ill have to have a good play first with that but its nice to know there was once someone in the same position as me heheheh. Also I think I’m going to move round the start of the heater wiring to the closest place to the transformer ie the el34s instead of the light where it is currently set up as a ring main and that should completely destroy any hum. I tried swapping the Mullard EF86s with a new pair EF86 (can’t remember the make) and it was just a noisy. Decreasing the gain should reduce the noise in theory. I’m curious to hear if it works for you. Please let us know if moving the heater wires closer to the EL34 reduces hum. 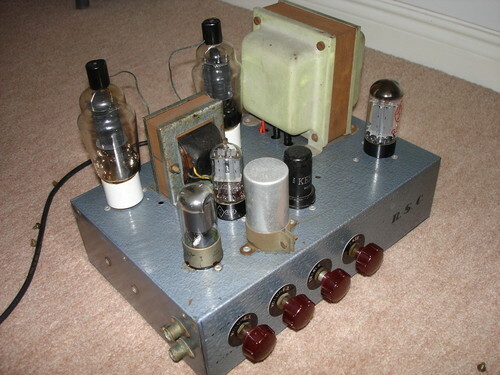 I’d love to see pictures of your amp, don’t hesitate sending some and I’ll put them here. Replacing all electrolytic capacitors is a good idea indeed and will help reducing the hum and general performance of the amp. You could also replace all the other capacitors (especially the greasy aluminium foil ones). Replacing the resistor with metal film one should also help reducing noise and clarity a bit. As far as I recall the original design sets the EF86s in very high gain pentode mode, which has the drawback of generating a lot of white noise and making the EF86s very prone to produce microphonics. Схема очередного Linear Conchord была упрощена максимально. Остались лишь три лампы. и Sarah Vaughan фабричного производства. 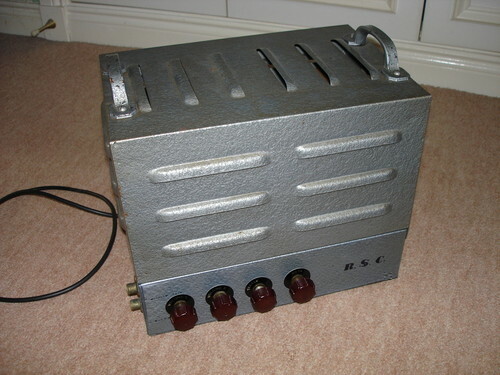 Very Rare Vintage 1950`s RSC A10 Valve amplifier made in Leeds in the UK approx 1956 it`s the predecessor to the Linear Conchord.Fantastic condition for it`s age and in excellent working order.Except for a Brand New JJ GZ34 rectifier and 6SN7GT eq phase splitter valve several NOS mustard capacitors and a new mains lead it is completely original and in excellent working order.Comes with it`s metal base plate and louvred cover.The last picture is of an original advert in the Wireless World February 1960 (slightly later version) when it cost 11 gns - £11 and 11/- shillings.This is only for the UK as postage will be expensive due to it`s weight. айфон 2012 года или мыльница Canon 2005 года ?